For a change from beaches, just 12 miles (19km) inland west of Alicante is Europe's only palm forest, forming a lush oasis around the city of Elche (Elx). The city boasts several beautiful parks, public gardens and palm groves. The Palmeral of Elche, an orchard of more than 200,000 palm trees, ia a UNESCO World Heritage Site. The Parque Municipal is one of the most popular places to enjoy the trees, with the palms interspersed by grassy promenades and children's playgrounds. The most beautiful palm garden is the Huerto del Cura, filled with trees, water features and bright flowerbeds. Another attraction in the city, located right next to the municipal park, is the Altamira Castle, which was built in about the 12th century and was renovated in the 15th century. 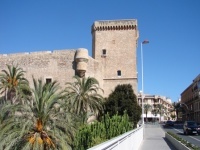 The fortress has been used as a prison, a town hall and a fabric plant but now houses the Elche Archaeology and History Museum. A wealth of archaeological remains have been found in Elche, unsurprisingly as the region was settled by the Greeks, Carthaginians and Romans. The most famous find is the stone bust called the Lady of Elche, dating from about the 4th century BC, which is now displayed in the National Archaeological Museum of Spain. Transport: Elche can be reached by an hourly train service from Alicante, or by regular bus connections.